Proprietary Name: Mko Melt Dose Pack What is the Proprietary Name? Non-Proprietary Name: Midazolam - Ketamine Hcl - Ondansetron What is the Non-Proprietary Name? 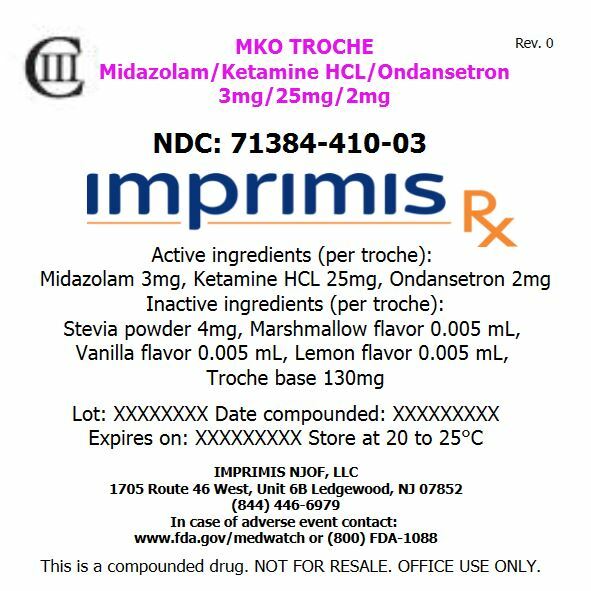 Mko Melt Dose Pack with NDC 71384-410 is a a human prescription drug product labeled by Imprimis Njof, Llc. The generic name of Mko Melt Dose Pack is midazolam - ketamine hcl - ondansetron. The product's dosage form is troche and is administered via sublingual form.